When Elaine Russell was five, her dad built the family a shack just outside the Aboriginal mission at La Perouse in Sydney. 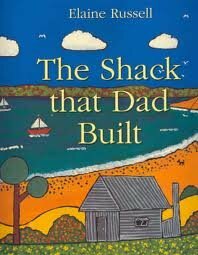 In The Shack that Dad Built, Elaine illustrates what life was like for an indigenous kid on the urban fringes. Her recollections range from the happy memories of hide-and-seek in the sand dunes and hunting for bush tucker to more bittersweet memories, such as her "Saddest Christmas Ever" (when the charity responsible for distributing presents to the local Aboriginal kids ran out of toys just as Elaine reached the head of the queue). Elaine's colourful, painterly illustrations vividly recreate these childhood experiences.